Why should libraries market themselves? The library as a corporation; Creating a SWOT analysis; Areas to consider in a marketing campaign; Merchandising and branding; Marketing strategy; Poster guidelines; Other tools of communication: News announcements, public relations, newsletters and annual reports; References, further reading and resources. 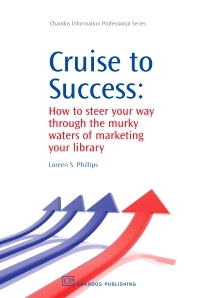 Cruise to Success is a hands-on guide and handbook to create a library marketing campaign. Examples and step-by-step instructions assist both the novice and expert in presenting a campaign to attract the campus community to the library’s resources. Loreen Phillips, Head of Information Literacy Services at McDermott Library, coordinates the library instruction program. Her responsibilities include instruction and outreach, reference. She has been a librarian for over 20 years and has been marketing her library for over five years.